Luther Konadu, Gestures on Portrayal, 2017. Chromogenic print, 20x16 in. Courtesy of the artist. Luther Konadu, Viewing Viewer biew, 2018. Chromogenic print, 20x16 in. Courtesy of the artist. 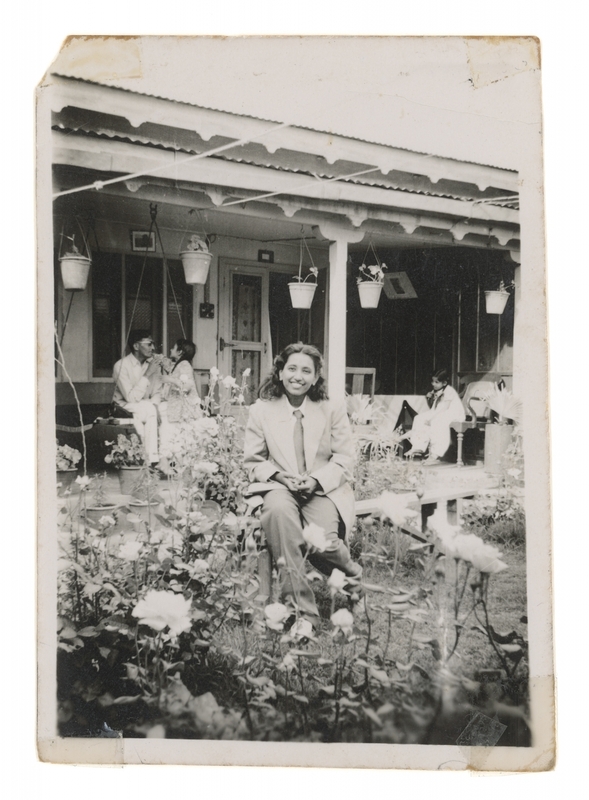 Zinnia Naqvi, Nani in Garden, 1948, 2017. Inkjet print, 48x35 in. Courtesy of the artist. Zinnia Naqvi, Nani in Safari Hat, 1948 and Self-Portrait as Nani, 2017, 2017. Inkjet print, 38 x 28" ; 26 x 25". Courtesy of the artist. 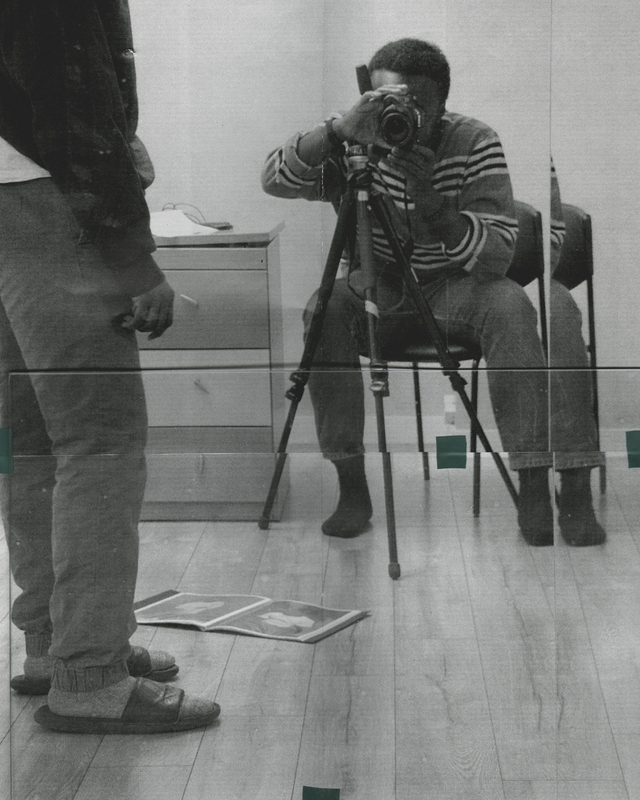 An artist of Ghanaian descent, Luther Konadu is interested in photography’s construction of portraiture and how it is used to record and “know” the Black body in Western visual culture. Photography’s documentary mode has dehumanized African-American and -Canadian subjects by supporting racist agendas endemic to Western epistemologies. Popular culture sensationalizes the Black body, while social and cultural agents repeatedly demonize it. Most often, the body is absent or unacknowledged. Konadu navigates these troubled waters by taking control of the photographic session. His photo shoots are casual yet purposeful, functioning as communal experiences where friends and acquaintances declare their confidence and command of the photographic space by directly confronting the camera. Because the subject is an active recipient of the gaze, viewers must position their ideas, presumptions, and feelings with respect to what they see. The medium’s materiality, and by extension the subject’s corporeal existence, is alluded to through photographs that incorporate tape, sticky notes, and frames—hung, leaning, or jutting out—to create a sculptural presence in the gallery. Zinnia Naqvi’s work employs aspects of her personal and familial history to explore issues of colonialism, race, and gender. 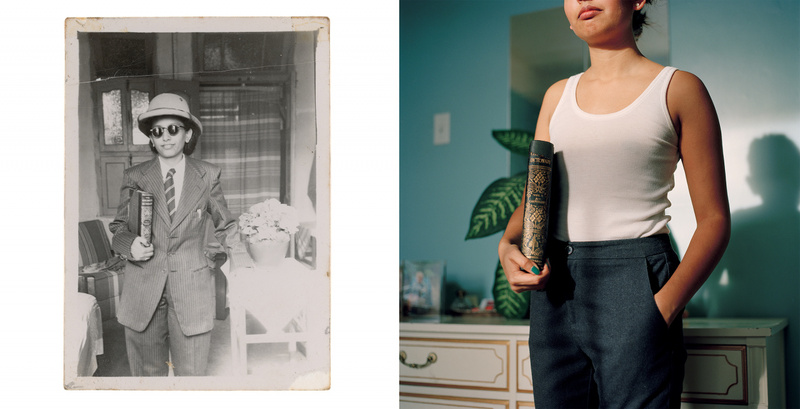 Her use of family photographs acknowledges the power of photography to maintain a voice for those who have come before, their message activated by a descendant’s desire to preserve values, traditions, and lineage. Dear Nani (2017) is based on found photographs of the artist’s grandmother engaged in a cross-dressing performance, wearing her husband’s clothes. Naqvi connects to her grandmother’s performance by reenacting the event, and in so doing, accentuates the different realities, global and personal, that inform family histories. Mimicry is an essential component to the artist’s photographs, whereby identities of the colonized, post-colonized, and colonizer mingle. In her installation Veena (2016), the artist projects the profile of an Indian woman onto saris. The woman’s voice, a product of the Apple computer’s “speech” function, recounts difficult immigrant experiences. The act of simulation introduces a sense of disquiet into Naqvi’s inquiries, emphasizing the in-between status of immigrants and the imperfect translation of their historical and geopolitical realities. 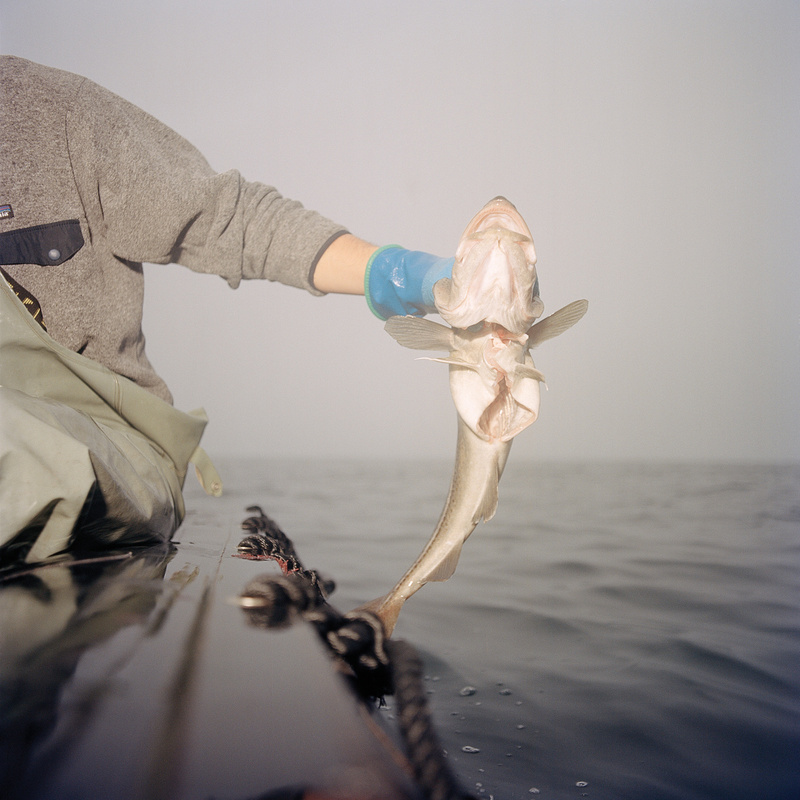 Ethan Murphy’s work reflects on identity and familial and communal history as they pertain to place, specifically St. John’s, Newfoundland. Leaving his hometown for Toronto after his father’s death instilled a sense of isolation and nostalgia in the artist. 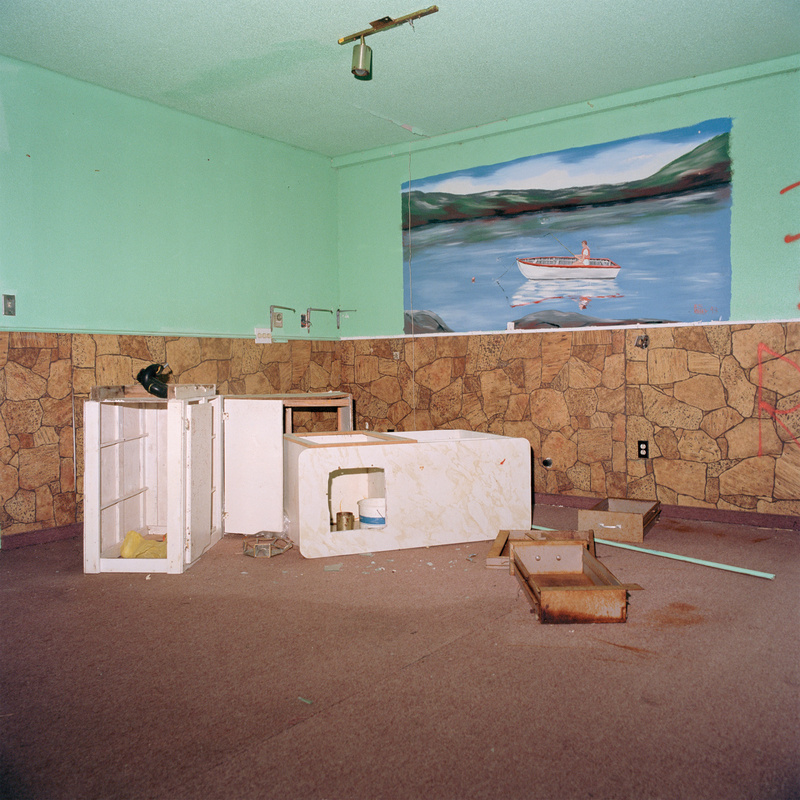 He negotiates this challenging terrain through photographs of Bell Island, where his father’s house is located. Murphy displays his journey in a non-linear fashion to immerse the viewer in the subject matter. A sense of place is understood as fragmented; a composite of memory, history, continued living interaction, and the passing of a parent. The photographs were taken over a period of time, with the artist retracing his father’s steps to visit his favourite sites. The images reflect an act of homage and self-discovery, and function as accumulations of memory. Hung salon-style, they are grouped in the gallery space to offer a coalescence of narrative that could be just as easily reconfigured to present yet another story, offering a different perspective. Konadu, Murphy, and Naqvi all create works that draw upon photography’s pliant character and its chameleon capacity to shift meaning dependent on context. The artists each present photographs in an open-ended fashion, using an installation mode of presentation to foster different kinds of encounters and challenge the idea that the medium depicts a singular truth about its subject matter. Photographs interact to create a constellation of relationships, encouraging viewers to arrive at their own understanding of the work, and consider how their own backgrounds, biases, and values can affect their interpretation. The New Generation Photography Award was founded by the Canadian Photography Institute of the National Gallery of Canada in partnership with Scotiabank. 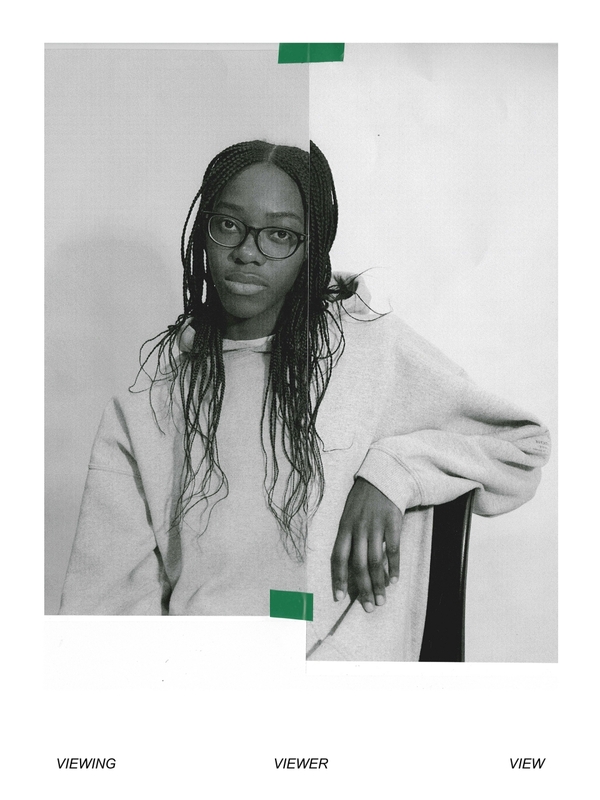 Konadu, Murphy, and Naqvi were selected by the award jury from 12 nominations by members of the arts community, including photography experts from arts universities and colleges across Canada. * Presented at the NGC from September 27,2019 to March 22, 2020.